Whether you lost your keys to your Weigh Safe Hitch or want some extras, we have you covered! 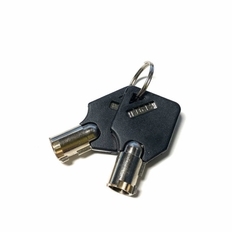 This pair of factory Weigh Safe Replacement Keys are exactly what you need. Please be sure to select your Weigh Safe key number above from the drop down menu. The key number is stamped on both the Weigh Safe keys and on the Weigh Safe lock itself right above where the key is inserted.